During the lifetime of the Promised Messiah (on whom be peace) it was mentioned by someone in a Jalsa speech that the only difference between the mission of the Promised Messiah (on whom be peace) and other Muslims was that the others accepted that Jesus (on whom be peace) ascended to the heavens alive while we believe that he died a natural death. This did not clarify the objective of the advent of the Promised Messiah (on whom be peace) who in spite of suffering from ill health made a speech to fully elucidate the matter. He said his advent was not simply meant to distinguish between life and death of Jesus (on whom be peace) but entailed many other factors. He gave a detailed discourse on matters that had caused the decline of Muslims and for the reformation of which he had been sent. One of these was avoiding falsehood and upholding truth. He advised his Jama’at to raise their standard of truth adding that simply accepting his advent was not enough. When the message of the Promised Messiah (on whom be peace) will be relayed in his words [in this Friday sermon] those who do not quite meet the standard required will realise it. Shirk (associating partners with God) and falsehood have also been mentioned together in the Holy Qur’an as if falsehood is as big a sin as shirk is! The Arabic word الزور ‘zoor’ is used in the aforementioned verse to denote falsehood. It means lying, associating partners with God, assemblies or places where falsehood is rampant, gatherings of song and idle, frivolous pursuits etc. People of God do not tell lies and do not attend places where falsehood and frivolity is common, nor do they go to places where idolatrous practices are pursued and they do not give false testimonies. Those who avoid all these situations are true believers. In his address the Promised Messiah (On whom be peace) said that the cause of internal strife among Muslims was love of the world. He said had pleasure of God been their objective, they could have easily understood which creed among all the sects was the right one and would have followed it. Yet, how could people who did not follow in the footsteps of the Holy Prophet (peace and blessings of Allah be on him) be called Muslim? God has stated: Say, ‘If you love Allah, follow me:then will Allah love you and forgive you your faults…’ (2:32) If, instead, precedence is given to the world, could it be following the Holy Prophet (peace and blessings of Allah be on him)? Was the Holy Prophet a worldly man, did he practice usury? Did he give precedence to the world over faith? These matters should be pondered over and footsteps of the Holy Prophet (peace and blessings of Allah be on him) should be followed to discover how this will be followed by God’s grace! The Companions of the Holy Prophet certainly adopted the right ways and God transformed their lives. They became completely distant from worldly matters. Compare your situation with theirs; are you doing what they did? People think nothing to give false testimonies in court cases in exchange of small amount of money. Can lawyers say that all witnesses they present in court cases are truthful? The situation is very fragile in this regard. Not only false witnesses are produced and false court cases brought on but even false documents are created and the truth is avoided in everything. Could those who argue that this mission (of the Promised Messiah) was not needed say if this is the teaching the Holy Prophet (peace and blessings of Allah be on him) bring? God has called falsehood as something foul and has likened it to idolatry. It is stated: ‘…Shun therefore the abomination of idols, and shun false speech.’ (22:31) Just as the foolish leave God and turn to idolatry, similarly, those who shun truth rely on falsehood and this is why God had made association between idolatry and falsehood. Just as an idolater seeks salvation from idols, one who relies on falsehood also seeks solutions therein. People say how we could leave falsehood, it is simply not possible to get by without it! But the Promised Messiah (on whom be peace) said truth alone leads to success. The Promised Messiah (on whom be peace) related his personal experience. A Christian lawyer named Ralya Ram filed a court case against the Promised Messiah (on whom be peace). The Promised Messiah, (on whom be peace) had written an exposition and mailed the manuscript to a publishing house. Also included in the package was a letter addressed to the manager containing instructions. According to the postal regulations it was illegal to include a letter in a package and carried a fine of Rupee 500 or imprisonment for six months. The Promised Messiah (on whom b peace) was not aware of such a regulation. Upon arrival of the package, Ralya Ram at once informed the postal authorities of this irregularity. A lawsuit was filed against the Promised Messiah (on whom b peace) who saw in a dream that Ralya Ram had sent him a venomous snake but the Promised Messiah had fried it and sent it back to him. When the case came up for trial, the Promised Messiah’s lawyer advised him that the only way he could escape conviction was to say to the court that he did not place the letter in the package. Instead it was Ralya Ram who had placed the letter there in order to get him into trouble. The Promised Messiah (on whom b peace) rejected this advice and said that the fact of the matter is that I had myself placed this letter in the package, therefore, I will not deny it. His lawyer told him that this would leave no chance for acquittal to which the Promised Messiah (on whom be peace) said come what may, he would not give up saying the truth. The Promised Messiah (on whom be peace) said that there was nothing as wicked as falsehood. Worldly people say that people who tell the truth end up being penalised. He said, how could I accept this because I have been through seven court cases and did not use falsehood in even one of them and with the grace of God did not lose a single case. How could God punish a truthful person! He explained that when some people are penalised for speaking the truth, their castigation is not due to being honest. Rather, its cause is some hidden, unknown sin or wickedness of theirs that God has knowledge of. For example once a man beat up his cook only because he did not get the seasoning right. When his attention was drawn to the disproportionate chastisement he said that the cook had been with him for a long time and had been very well looked after. Likewise, a large hoard of man’s wickedness at times brings about him being caught and penalised. The Promised Messiah (on whom be peace) gave this advise with great pain. He wanted to bring home the fact that apart from the creed of Jesus (on whom be peace) returning or not returning [physically] to the world, it was most significant to completely free oneself from shirk and make one’s practice such that it does not even have a hint of shirk. He stressed to establish truth and abhor falsehood. Every Ahmadi should self-reflect and see how much they match up to what is expected of them. Do we use falsehood in court cases, or tell lies for monetary gain? Do we not say the truth when arranging matrimonial matches, and not follow qawl e sadeed (the right word)? Do we use falsehood to extract social or welfare allowances from the state? Many people fall under a negative light in this regard. Income is also not disclosed to gain state benefits and this in turn is tax evasion/fraud. It should be clear that every government is experiencing problems due to the general downward financial trends and any government that may not be in such a situation right now, is going to be in future. As such, governments are scrutinising matters of welfare and benefits very closely. Anything negative in this regard not only creates personal difficulties but can also be a cause of disrepute for Ahmadiyyat. Those who use falsehood for such purposes should not keep worldly advantage in view but should try and please God by avoiding falsehood and by living on small means. Be mindful that falsehood is not used in asylum applications. Certainly, lawyers have always incited such practices, as the Promised Messiah (on whom be peace) also said. Office-holders should also self-reflect whether they report falsely. They may not be telling lies but are they also abiding by qawl e sadeed and saying/reporting what is the unambiguous truth? Matters should be dealt with righteousness. Each person should deal with matters devoid of personal gain, devoid of egotism and with only fear of God in view. If this is not the case, then as the Promised Messiah (on whom be peace) said everything is but an expression of love of the world! And this leads to divisions and discord and unity and accord of community or at least in a specific section of community is lost. And the unity that the Promised Messiah (on whom be peace) came to establish is lost. Islam was split in sects due to love of the world and this could also further lead to such divide. Thus, one evil gives rise to many. 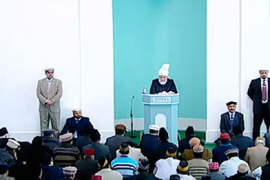 We have great responsibilities as Ahmadis and true Ahmadis are those who try to follow the blessed model of the Holy Prophet (peace and blessings of Allah be on him). Those who wish to turn to God and attain Divine nearness usually employ haste and do not realise that matters of faith require great patience and steadfastness. People work night and day for worldly goals and wait years to see results but when it comes to matters of faith, they wish to become saintly at mere blowing of breath and wish to experience high heaven instantly. And this without putting in any hard work or having experienced any hardships and trials. Spiritual development is indeed gradual and one cannot please God with mere words. It is stated: ‘Do men think that they will be left alone because they say, ‘We believe,’ and that they will not be put to trial?’ (29:3)Indeed, each blessing requires hard work. And Islam makes no such arduous demands, for example, as monks and hermits in other faiths have to go through. The teaching of Islam is: ‘Surely, he prospers who augments it,’ (91:10), that is, one who leaves every harmful innovation and selfish desires and assumes the way of God! May we bring about change in our practice, understand the significance of truth and give precedence to faith over worldly matters. After taking bai’at, may we truly and not merely in words understand the advent of the Promised Messiah (on whom be peace) and try our very best to follow the blessed model of the Holy Prophet (peace and blessings of Allah be on him) and deem God’s pleasure the most important of all. Funeral Prayer of Kassim Touré Sahib, our missionary from Ivory Coast was announced. He passed away on 25 January. He was a moosi and had served the Jama’at since 1986. Among his services was translation of Friday Sermons in Joomla language.